My independent work box station is one of my favorite activities for my students. It's amazing to watch them grow more and more independent and begin to work on these tasks all by themselves. Also, my students find so much satisfaction and pride in being able to do tasks on their own tool! Plus, I know a lot of classrooms are short on aides. 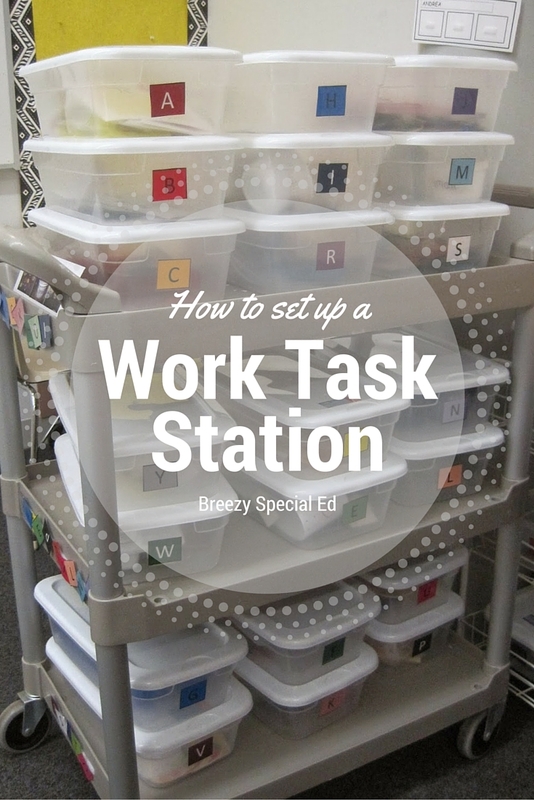 After teaching your students how to use a work task station, you shouldn't even need any aides to run it so you can utilize them where needed (just obviously with someone keeping an eye on things in case a student needs redirection!). What kind of tasks should I have? You should have tasks that your students can complete independently. Sure, you want to challenge them a little bit (for example, don't give a student who can alphabetize a simple color matching task), but the overall goal for this station is independence and following a schedule - a VERY IMPORTANT life and vocational skill! See my Pinterest board here (or below) for ideas and for pictures of the work tasks I included. 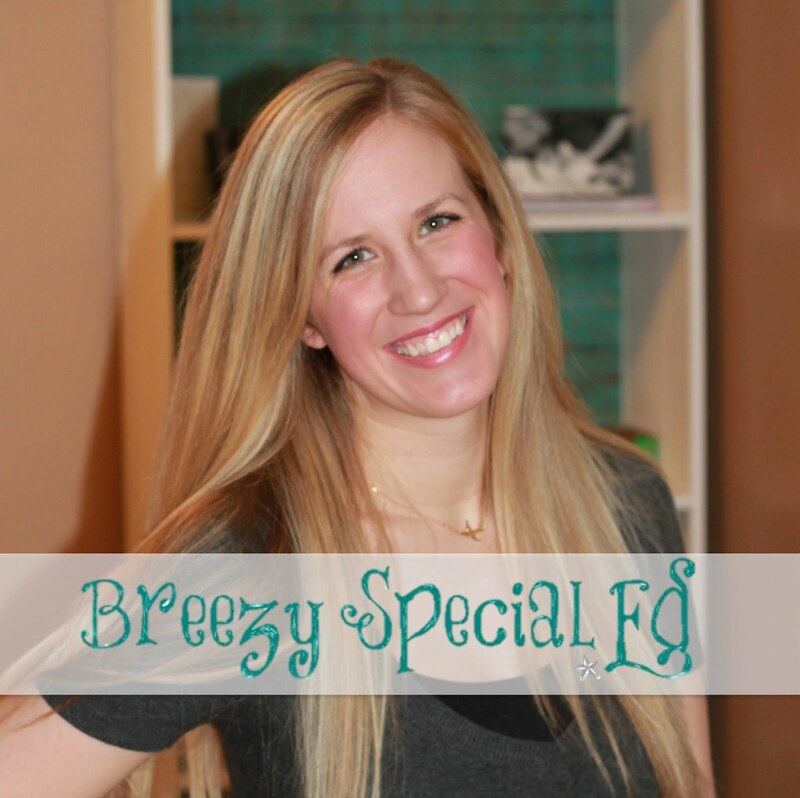 Follow Breezy Special Ed's board Work Tasks / TEACCH Boxes on Pinterest. You can also look through my boxes in the links below. Look around your classroom and see what you can find to make into tasks before you go out and buy stuff. You might be surprised what you find! How do I set up my student's schedules? A weekly master schedule is your best friend! I scheduled my student's boxes so that no two boxes were done on the same day, so that the student schedules could be set up in the morning by an aide and be ready to go. Sometimes students repeated tasks in a week, but for the most part, they had a variety of 12-15 boxes that they complete weekly (some students don't do work tasks on various days due to shortened schedules or therapies). This also made data easy to compile because each day of the week had the same boxes. How do I teach my students the schedule? Start with very simple tasks. You want them to learn the routine first. Set up their schedules beforehand and have your student find their schedule with their name on it (for student who are working on identifying their name, I choose a unique color for their schedule card or put a sticker on it to help them identify their schedule). Once a student finds their schedule, I have them find the boxes that match the icons on their schedule. I used letters for my icons and put different color backgrounds on all of them to further help my students find what they are looking for. When the student find their boxes, they put them on the table. (For some students, you will probably have to do this step for them and have them start right at their desk). The students then work through their schedule in a left to right order (or top to bottom). When my students finish a task, I have them put the completed box back on the cart (with the work still in place so I can check it later), and they take the icon off of their schedule and place in a "finished" cup and move to the next box! Teach your students the routine and soon this station will run instead. I speak from experience when I say that you will amazed and so proud of what your students are able to achieve independently! Let me know if you have any other questions in setting up a work box station. Where did you get that bookcase/shelving on wheels? I have some 4 shelf bookcases from Walmart, but, in a fit of rage, a kiddo pushed one over and now I'm scared to have them freestanding! Hey Kelly! We just had some extra carts at my school, so I used one. Always making due with what I can find! Hm, that is tricky, what if you have them against a wall? Maybe your school would even let you secure them to the wall if you explain your concerns? I use l brackets to secure the bookcases . You can secure them to the wall to each other etc. much more stable It is a building Health & safety Issue. Just say that to your administrator. Do you have your students do this system as a center/station or do you have them do it all at the same time at their individual desks? If you do it in a center, what subject do you use this center during? We do it as a station during our math and language arts block. This is great because it frees up staff and myself and students don't need direct 1:1 supervision during this task! Do you go through each task box to explain it before hand??? I am trying to teach my K-1 students how to complete work tasks. I was wondering how you introduce the individual tasks to the students. Do you have someone assist them during the first few attempts during work centers, or do you teach them yourself during another time of day? It depends. If they don't know how to do the task at all, I would teach/practice at a different time, and it wouldn't be added to the work boxes until they can do it independently. If they will catch on to the new task quick but need to be shown what to do, I would do that during the work task time. Also, if they are learning how the work task station runs in general, I think it makes sense to teach them the procedures during that scheduled time. Hope that helps! Do you use the same work task schedule each week or do you change the schedule weekly/ monthly/ as needed to prevent boredom?